I have a wonderful giveaway to share with that you that the generous people at Scarology are allowing me to host. 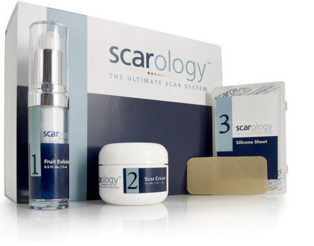 Scarology offers a hospital grade, 3-step scar healing system. The system is effective in treating all scar types and suitable for both adults and children alike. Summer is here and the warmer weather means showing off a little more skin. Do you have any scars that you are a little self conscious of? Scarology's Ultimate Scar Removal System can help you reveal your smoother, scar free body. How does it work? The kit includes a 3-month supply of Natural Fruit Acid Exfoliator, Ultimate Scar Cream and 6 Reusable Silicone Scar Sheets. 1. Start your morning by spreading the exfoliator over your healed scar, massage for 1-3 minutes and rinse off. The exfoliator removes the unhealthy skin layer revealing healthy skin. 2. Apply the cream, designed to provide your skin with nourishment to hydrate and reduce inflammation. This cream should be applied both morning and night. 3. Apply a self-adhesive scar sheet to dry skin, prior to going to bed. The sheet will provide the compression and nourishment to heal your scar overnight. Scarology's Ultimate Scar Removal System can be used on old and new scars, it works on stretch marks, C-section scars, burn scars, acne scars, really any scar. You can purchase this kit online. One lucky Girly Girl reader has the opportunity to win an Ultimate Scar Removal System. This giveaway will end on June 19, 2016. I will choose the winner using Random.org. Please leave a valid email address if it is not visible in your profile. Contest is open to continental US only. I would love to win because I have a scar on my face that used to not be so bad, but now that I am aging, it looks worse. It photographs terribly. This product sounds good to try. I'd love to try this product on my c-section scars. I like GGG on GFC. I follow on GFC! -- emrelove at aol dot com. I have some scars I would like to use this on. I would be very happy to win!